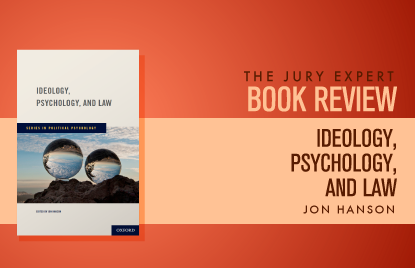 Over at The Jury Expert, You can read an insightful review (by Rita R. Handrich, PhD) of Jon Hanson’s recent book, “Ideology, Psychology, and Law” (Oxford University Press). [Introductory chapter available, here]. Trial consultants, and the very best trial lawyers, practice with an awareness of the law, the domain of the case facts, and the way jurors are likely to understand and misunderstand all of it. If these avenues of thought had a single intersection, you would find that Jon Hanson has been living on that corner for 25 years. As a Harvard Law School professor and prolific writer, he has done much to keep me and many others informed of the traffic coming from these diverse directions. . . . 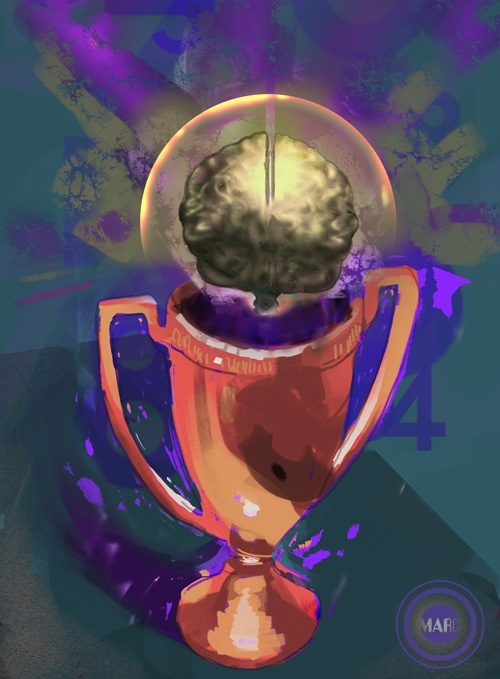 The Situationist blog, run by the Project on Law and Mind Science at Harvard Law School, recently received the 2011 Media Prize awarded by the Society for Personality and Social Psychology, an international organization of scholars devoted to social and personality psychology. Harvard Law School Professor Jon Hanson established the Situationist with Vermont Law School Professor Michael McCann LL.M. 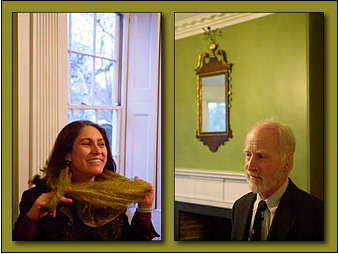 ’05 to share the work of the Project on Law and Mind Science, which Hanson directs. The project seeks to identify and understand the implications of social psychology, social cognition, and other related mind sciences for law, policymaking, and legal theory. Hanson and the PMLS team have run an annual conference since 2008 on topics such as “The Psychology of Inequality” in 2011 and “The Free Market Mindset” in 2009. Many of the speakers at the conferences are regular contributors to the blog. Read more about “Situationism” on the award-winning blog. 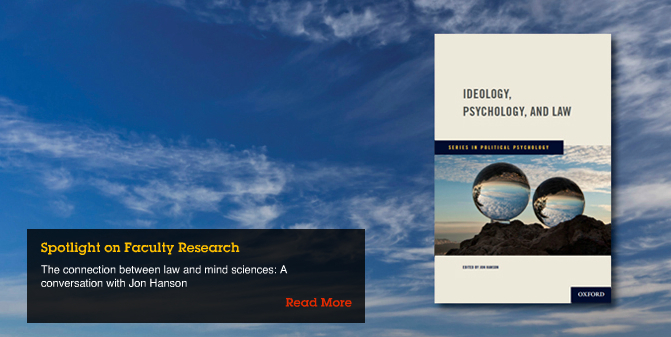 Hanson is editor of a collection of articles titled “Ideology, Psychology, and Law,” which is forthcoming from Oxford University Press in November. Read more about awards and praise for Situationist Blog here. The symposium is being held at Case Western University Law School, and is funded in part by the Arthur W. Fiske Memorial Lectureship Fund. It it co-sponsored by: Center for Professional Ethics, Frederick K. Cox International Law Center, Institute for Global Security Law & Policy, Law-Medicine Center, and Center for Social Justice. You can find more details about the symposium, the participants, and the agenda here. You can view more at “Harvard Law Spotlights Situationism” and “Jon Hanson on Situationism and Dispositionism,” which contains other related Situationist links. What Does Situationism Mean for Law? To watch the first part of Hanson’s BigThink interview, see “Jon Hanson on Situationism and Dispositionism,” which also contains other related Situationist links. 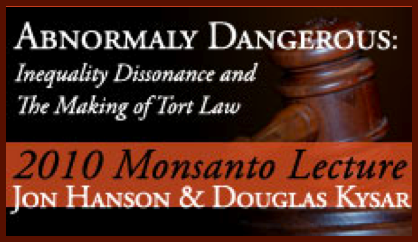 Situationist Contributor Jon Hanson and Yale Law Professor Doug Kysar are co-delivering the 2010 Monsanto Lecture on Tort Law and Jurisprudence tomorrow at Valparaiso University School of Law. Their lecture is titled “Abnormally Dangerous: Inequality Dissonance and the Making of Tort Law.” Here’s the abstract. At the conceptual heart of tort law rests a choice between negligence and strict liability as the default standard of care for unintentional wrongs. The prevailing American view holds that strict liability should be reserved for rare cases in which an activity poses significant hazards even after a defendant has taken all reasonable care. The types of explanations for that preference have shifted over time from a classical liberal rationale to an economic efficiency rationale. Neither of those explanations is fully persuasive on its own terms, as a careful examination of leading cases makes clear. So what might explain why courts sometimes prefer a negligence standard, when their logic could as easily have led them to a strict liability alternative? There is growing evidence from the mind sciences that the reasons people give for their behavior and decisions are rarely causal and are often confabulatory. The field of social cognition, for instance, has demonstrated through countless experiments that “implicit attitudes” and “implicit motives,” which lie outside the purview of introspection, play a far more significant role in shaping our attitudes, ideologies, and behavior than most of us realize—or care to acknowledge. Among the most studied and influential implicit motives are the “cognitive closure” motive and the “inequality rationalization” motive. Focusing primarily on Judge Posner’s famous and influential opinion in Indiana Harbor Belt R.R. Co. v. American Cyanamid Co., we examine whether an understanding of those implicit processes might help explain why he held that the activity of transporting highly toxic and flammable chemicals through residential neighborhoods was not abnormally dangerous and thus not subject to strict liability (and why, more generally, negligence has so thoroughly dominated strict liability as the default standard of care). We investigate further whether such implicit dynamics left unexamined might themselves be abnormally dangerous. Doug Kysar and Situationist contributor Jon Hanson recently posted on SSRN their important 1999 article, Taking Behavioralism Seriously: The Problem of Market Manipulation (74 N.Y.U.L. Rev. 363) on SSRN. Here is the article’s abstract. For the past few decades, cognitive psychologists and behavioral researchers have been steadily uncovering evidence that human decisionmaking processes are prone to nonrational, yet systematic, tendencies. These researchers claim not merely that we sometimes fail to abide by rules of logic, but that we fail to do so in predictable ways. This Article contributes to that reassessment by focusing on the problem of manipulability. Our central contention is that the presence of unyielding cognitive biases makes individual decisionmakers susceptible to manipulation by those able to influence the context in which decisions are made. More particularly, we believe that market outcomes frequently will be heavily influenced, if not determined, by the ability of one actor to control the format of information, the presentation of choices, and, in general, the setting within which market transactions occur. 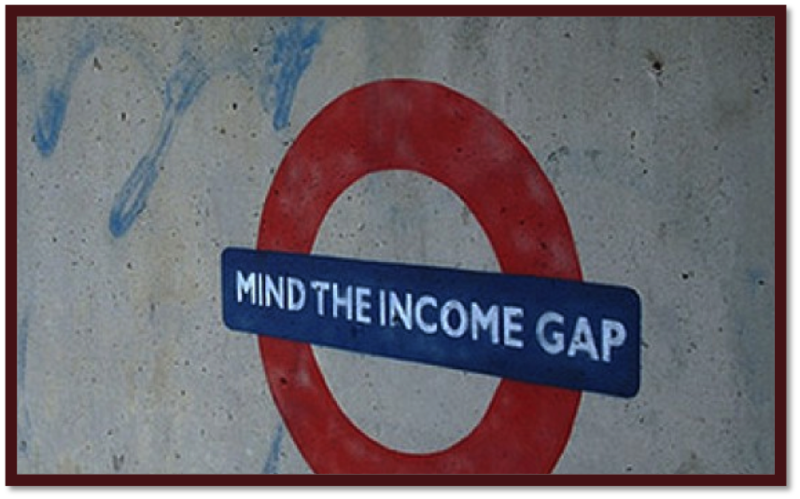 Once one accepts that individuals systematically behave in nonrational ways, it follows from an economic perspective that others will exploit those tendencies for gain. That possibility of manipulation has a variety of implications for legal policy analysis that have heretofore gone unrecognized. This article highlights some of those implications and makes several predictions that are tested in other work. SSRN has just announced its Journal of Behavioral & Experimental Economics and Journal of Behavioral Economics Top Ten lists for papers posted in the last 60 days. Taking Behavioralism Seriously made both lists. W. Mark Lanier, the plaintiffs attorney who won a $253 million judgment against pharmaceutical giant Merck & Co. over the fatal effects of its painkiller Vioxx, spoke to Professor Jon Hanson’s Torts class on November 19 at the law school. Professor Hanson’s Torts 6 class studies the various aspects of tort law, including the psychological, which was the focus of Lanier’s talk. Recounting his trial “war stories” for Hanson’s students, Lanier displayed the “theatrical flair” noted by The Wall Street Journal, which is key to his success in communicating with juries. He changed voices, accents and postures for different characters, and even removed his glasses to reenact the deposition of a witness by another lawyer. Describing the theory behind his approach, Lanier told the class that plaintiffs litigation is “a bit like professional wrestling meets ballet. The corporations pay for wonderful ballerinas who execute kicks with great precision. We tend to go in as professional wrestlers executing the Texas Tombstone Piledriver. And wrestling beats ballet.” In the Angleton, Texas, trial against Merck, Lanier’s “wrestling” included exhorting jurors to find against Merck with the biblical story of the young David defeating Goliath the giant. Lanier is a 1984 graduate of Texas Tech University School of Law and a part-time preacher. In 2006, he was named a Top 10 Trial Attorney as well as one of the 100 Most Influential Lawyers in America by The National Law Journal. Emily Dupraz wrote a nice summary (for the front page of the Harvard Law website) of Situationist contributor Jon Hanson’s recent lecture at Harvard Law School. Here are some excerpts (as well as a link to the webcast of the lecture). Individual free choice, an idea that permeates common sense and legal theory, assumes that actions reflect the stable preferences of individual actors. Individuals are responsible for their actions (that is, their preference-driven choices), and laws can therefore be designed on that assumption. But if that assumption is wrong, says Harvard Law School Professor Jon Hanson, then laws built upon it may not be advancing the ends they purport to serve. And Hanson’s view, steeped in interdisciplinary study in the mind sciences, is that the assumption of indvidual free choice is faulty. The decisions people make, he says, are often determined by influential factors in the situation—that is, non-salient and often invisible external and internal factors that influence, not only how we behave, but also how we make sense of our behavior. This is what Hanson calls “situationism.” Using social psychology and related mind sciences to help understand law and legal theory, he suggests that people, ideologies, and laws are shaped by forces quite different from those they imagine. While varying versions of the individual-choice model have served as the basis for most laws, policies, and mainstream legal theories, Hanson says, social psychology, social cognition, cognitive neuroscience, and related social scientific fields have uncovered many ways in which that model is detrimentally incorrect. 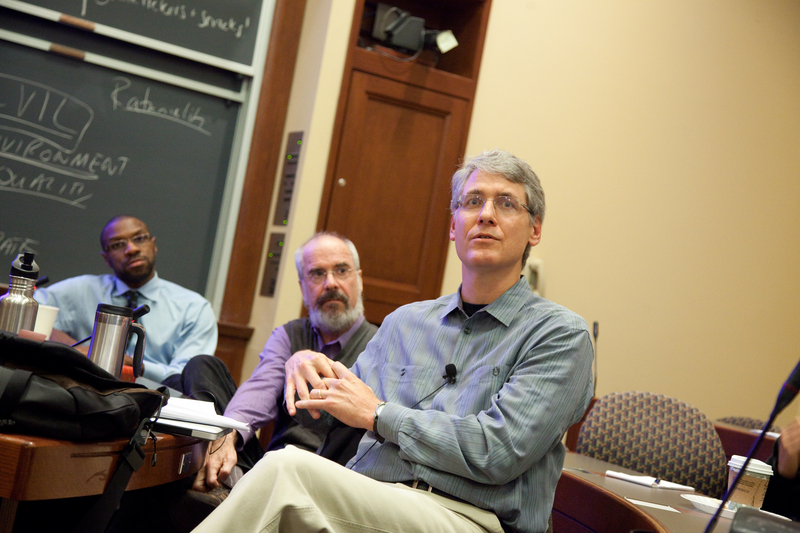 Hanson explored some of those ideas in an October 29th lecture at HLS entitled, “The Human Animal, Ideology, the Law, and other Situational Characters.” The lecture commemorated his appointment as the Alfred Smart Professor of Law. (Watch the webcast). The chair was endowed by the Smart Family Foundation, in honor of Alfred Smart, a 20th-century publishing entrepreneur who helped launch Esquire magazine and other publications. Among those in the audience was Hanson’s colleague, Professor Alan Stone, a psychiatrist and interdisciplinary expert in law and the mind sciences and a renowned film critic. 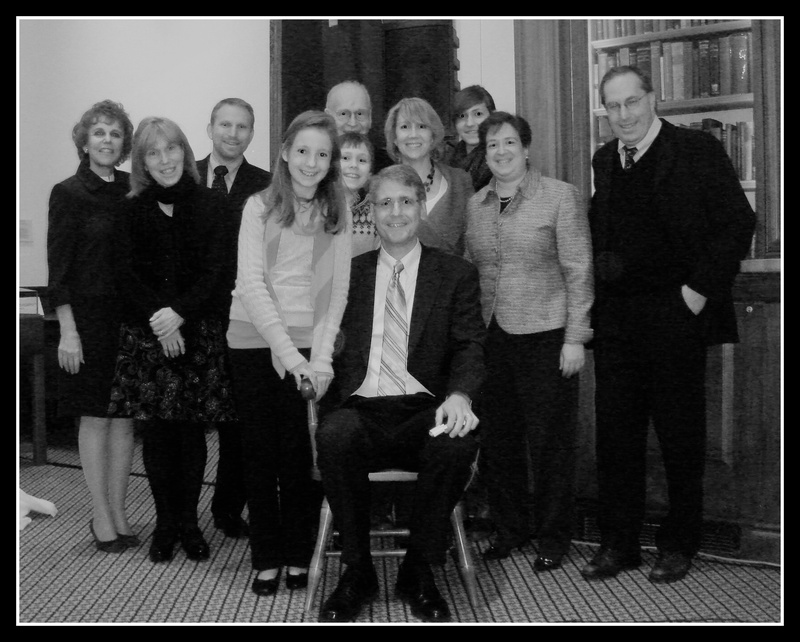 When Stone retires from the HLS faculty, the Smart chair will become the Alan Stone Professorship. Alfred Smart was Stone’s father-in-law. Hanson said that the mind sciences behind “situationism” have complex implications for the legal system, and that the law-making process must do a better job of taking into account how individuals make decisions. 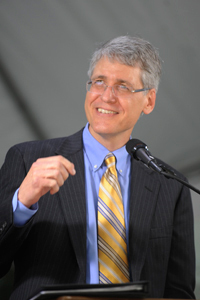 Hanson joined the HLS faculty in 1992 after receiving a law degree from Yale. Hanson is is an expert in tort and corporate law with a background in law and economics. He is co-director and creator of the Project on Law and Mind Sciences at HLS and contributes regularly to a blog that discusses the legal implications of human decision-making – The Situationist. Hanson received the 1999 Sacks-Freund Award for excellence in teaching and was a finalist in both 2000 and 2006. Stone is currently the Touroff-Glueck Professor of Law and Psychiatry, a joint appointment held with HLS and the Harvard Medical School. Kagan hailed him as “one of the earliest and one of the best interdisciplinary scholars at Harvard,” having forged his interdisciplinary paths among law and psychiatry and law and film studies for almost four decades. To watch the webcast of the video, click here. To read a Harvard Law Record article summarizing the lecture, click here. 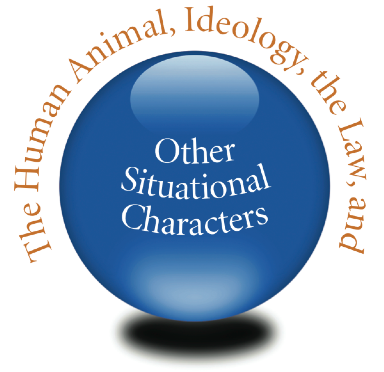 This evening, Situationist contributor and co-creator, Jon Hanson will deliver his lecture, “The Human Animal, Ideology, the Law and other Situational Characters” in honor of his appointment as the Alfred Smart Professor of Law (one day to the the Alan Stone Professor of Law) at Harvard Law School. This event will take place in Harvard Law Library’s Caspersen Room beginning at 5:00 p.m. with a reception immediately following the talk. Alan A. Stone is the Touroff-Glueck Professor of Law and Psychiatry at Harvard University. He graduated from Harvard College in 1950 with a degree in psychology, and earned his M.D. from Yale Medical School in 1955. Becoming interested in the intersection of law, psychology, and psychiatry, he first earned a position as lecturer at Harvard Law School in 1969 before earning a joint appointment with Harvard Medical School three years later. In 1978, he was awarded a Guggenheim Fellowship. Stone also has an avid interest in cinema, and serves as the film critic for the Boston Review.